Uncover the truth surrounding one of the most renowned & feared organizations in the world, the Vril Society. This compelling documentary explores conspiracy theories, retraces historical events, investigates internal agendas & uncovers macabre rituals. 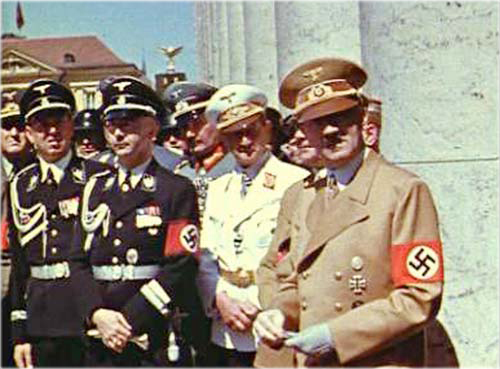 Profiling prominent & often famous members, alleged to include many of the Nazi Party elite, including Hermann Göring, Heinrich Himmler, & even Adolf Hitler, the program reveals information that the most clandestine of secret societies want to remain secret. Legend has it that the original members of the society believed they could live under the earth & fly to far away stars powered by a mysterious substance called Vril. They also believed that one day they would rule the world. This dangerous group existed at the core of the Nazi Party, & like many dark fellowships, remnants of the group still exist today, almost 100 years after its founding. In this special, viewers will discover what occult rites were performed by the organization in their dark lust for ultimate power. The London Blitz began on Saturday, September 7th, 1940, when the Luftwaffe shifted its focus from the RAF airfields it had been attacking & began bombing civilian London instead. On September 4th, in a major address at the Berlin Sportpalast, Hitler had excoriated the British for bombing Berlin & declared that the Germans would retaliate. “If the British air force drops 2,000, 3,000 or 4,000 kilograms of bombs,” the Führer told a wildly applauding crowd, “then we shall now in a single night drop 150,000, 180,000 & 320,000 kilograms of bombs & more.” Three days later, Hitler made good on his threat. The Luftwaffe’s September 7th raid began in the late afternoon with the dropping of incendiary bombs. These munitions lit fires that, in turn, gave directional guidance to the squadrons of Heinkel & Dornier bombers that followed & pounded London all night. The all-clear wasn’t sounded until four-fifty the next morning. 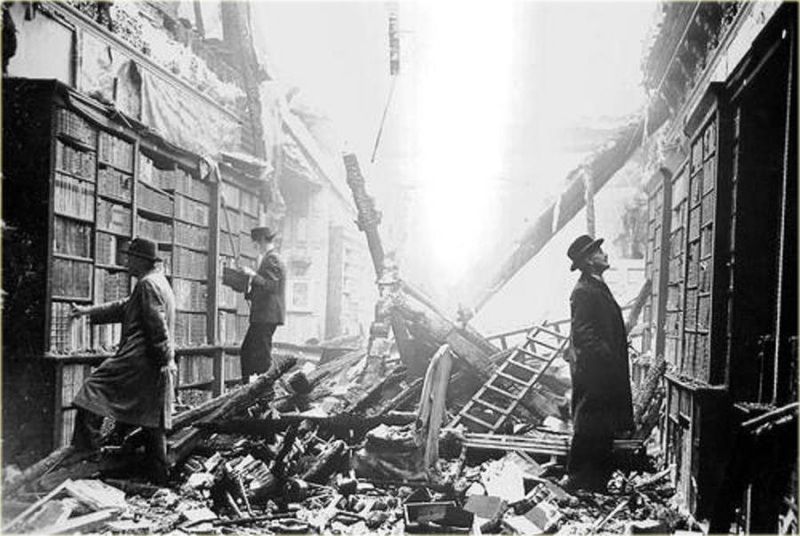 Although British censors kept specific details of the bomb damage out of the press, the destruction was obviously extensive, especially in the East End, where most of London’s port facilities were located. Many of the bombs fell on dockworkers’ homes, killing several hundred. Nevertheless, this change in German strategy proved to be a costly mistake. Frustrated with the slow pace of the battle of Britain, Hitler & Luftwaffe chief Göring had concluded that savaging civilian targets would pressure the British public into compelling their leaders to sue for peace. Instead, the terror bombing merely deepened British resolve, & far worse, gave something of a reprieve to the hard-pressed RAF, whose losses had been nearing a critical point. Whether or not continued bombing of the RAF bases would have won the Battle of Britain is a debatable matter; it quickly became clear; however, that the bombing of civilian targets – targets of questionable strategic value – wasn’t going to win anything, at least not in the short term. Two heavy German raids on September 15th, for example, resulted in such damaging losses for the Luftwaffe that Hitler & Göring decided that their efforts to destroy RAF Fighter Command had failed. Without air supremacy, of course, there could be no invasion, so on September 17th, Hitler postponed Operation Sea Lion indefinitely. The bombing of London continued; however, & in November Göring extended the campaign to Coventry & other cities in the industrial Midlands. In all, Churchill made five trips to Paris to stiffen Reynaud’s resolve during the battle for France, but he was never able to give Reynaud what the French leader most wanted: use of Britain‘s remaining fighter squadrons. Churchill knew that if Britain were to carry on alone after the fall of France, it would have to rely upon its navy & the Atlantic lifeline to America. Yet the Royal Navy couldn’t possibly bear up under such a stain unless the Royal Air Force (RAF) also completed effectively for control of the skies. After France’s defeat, a euphoric Hitler assumed that Britain, now isolated, would submit as well. Yet Churchill surprised the Führer by rebuffing several peace initiatives made through neutral countries, & Hitler instead went to work on a British invasion plan, code-named Operation Sea Lion. The chief problem that the German planners encountered was that they couldn’t transport large enough armies across the English Channel: The German navy had neither enough troopships to carry sufficient men & equipment, nor enough warships to protect such a fleet, even if one could be assembled. 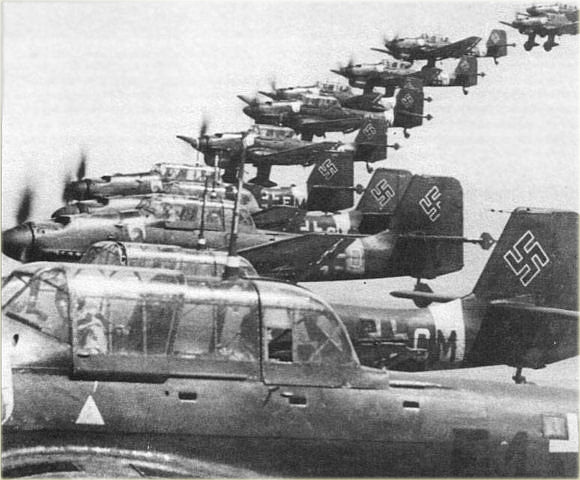 However, eager to shift the focus elsewhere, naval commander in chief Erich Raeder pointed out that, given any invasion scenario, air supremacy over the Channel would be vital. Therefore, while the naval planning continued, Hitler ordered the Luftwaffe chief Hermann Göring to eliminate the RAF. Goring accepted this task with his usual confidence, bordering on braggadocio. Wiping out the RAF’s Fighter Command wouldn’t be a problem, he told the Führer; in fact, Göring believed that his medium-range Heinkels, Dorniers & Junkers could likely bomb the British into submission without any invasion. The first phase of his air operations over the Channel began on July 10th, focusing primarily on British shipping lanes & thus rarely engaging the RAF. On August 8th; however, the Luftwaffe began attacking the RAF’s southern fighter bases in earnest, marking the start of the Battle of Britain. As the Germans soon learned; however, the British had several key technological advantages. The Hurricanes & Spitfires that they had been stockpiling since 1937, for example, could outperform most of the German fighters; & the new British radar, which had only recently become operational, now provided the RAF with reliable advanced warning of all incoming German planes. Thus the Luftwaffe could not use surprise, as it had in France, to destroy countless Allied aircraft on the ground. 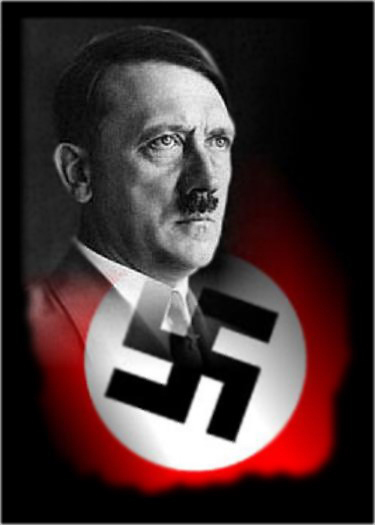 It remains uncertain whether Hitler intended from the start to exterminate the Jews. By mid-1941; however, mass murder was clearly the path he had chosen. Even though the Kristallnacht riots of November 1938 had accelerated Jewish emigration from Germany & the former Austria, there were still some 350,000 Jews living in the Reich when the war began in September 1939. To this number were soon added two million Jews living in Poland, & later, millions more in Western Europe & occupied Russia. 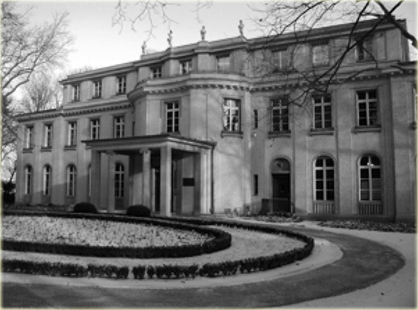 Heydrich’s plan, once approved, was presented to the Nazi bureaucracy on June 20th, 1942, at a meeting in Wannsee, an upscale suburb of Berlin. The fifteen officials present included representatives of the Ministry of Justice, the Ministry of the Interior, the Foreign Office, the Geheime Staatspolizei (Gestapo), & the governor-general of Poland. According to Heydrich, all 10.8 million Jews estimated to be living in Europe at the time would be “involved” – a euphemism typical of the language with which the Nazi elite described their “final solution.” That day at Wannsee, in working out the practical details of Heydrich’s plan, the Holocaust was formally launched. In the meantime, special SS squads known as Einsatzgruppen (task forces) were already killing hundreds of thousands of Jews in the East. Following the wake of the advancing Wehrmacht, these units obviated the need to ghettoize Russian Jews by shooting them on the spot. In September 1941, for example, Einsatzgruppen massacred thirty-three thousand Kiev Jews beside the ravine at Baby Yar. By late 1942, when implementation of the “final solution” finally shifted to the largest Polish death camps, the SS had already killed an estimated 1.4 million Jews. There are myriad theories out there about Hitler’s health. Some say he was a drug addict, others say he was the victim of a hypnosis gone wrong. Then there are the strange hypotheses about his genitalia. A new book, however, debunks most such ideas. Drugs & illness, the authors conclude, had little effect on his actions. But it was precisely Morell’s ability to treat his patient that those in Hitler’s inner circle questioned. For example, General Heinz Guderian called Morell a “fat, unappetizing quack,” & Hermann Göring, the morphine-addicted commander of the Luftwaffe, disparagingly referred to Morell as the “Reich syringe master.” Likewise, there were persistent rumors that the doctor had made Hitler dependent on certain medications & illicit drugs.